I was speaking to my local dealer at weekend, he was saying they are only getting about 3 at a time delivered and its about a 6 month waiting list, however he did say that the Forest Green colour will be coming at the end of the year.. I'll have to ring and check what's happening with mine next week. It was originally planned to be mine the last week in Jan, but I asked if I could pick it up first week of Feb as I'd already got that booked off and other commitments the last week of Jan.
Gadget, what accessories have you gone for? Last edit: 16 Jan 2019 00:13 by Hanslow. We need to see more owners pics! and yes what accessories? with pics and prices. I am more in the thinking will wait and see how they year goes, now my RX8 is still going ok, well MOT next month! Without wanting to tempt fate, seems I've been lucky and will be getting the exact spec I wanted, which I guess is what comes of being the only person who likes beige cars! Last edit: 16 Jan 2019 08:36 by Gadget. Do the parking sensors have a beeper or anything on the screen? is it the SZ5? Ivory with black roof? look forward to seeing pics! No idea about the parking sensors, I assume just a beeper. Not really needed, but seemed sensible to chuck on anything I might possibly need up front. Yes, auto SZ5 in Ivory with black roof. Gadget wrote: No idea about the parking sensors, I assume just a beeper. Not really needed, but seemed sensible to chuck on anything I might possibly need up front. Yea is a small car but think I would want on rear to at least, if not for me for the wife! lol As official part guess will look good and be fitted well. One of my first colour choices, enjoy! I guess depends on how much they are, if around 200 will be sensors with warning beeper and lights maybe, usually rear cameras are like £400+ option on most cars! 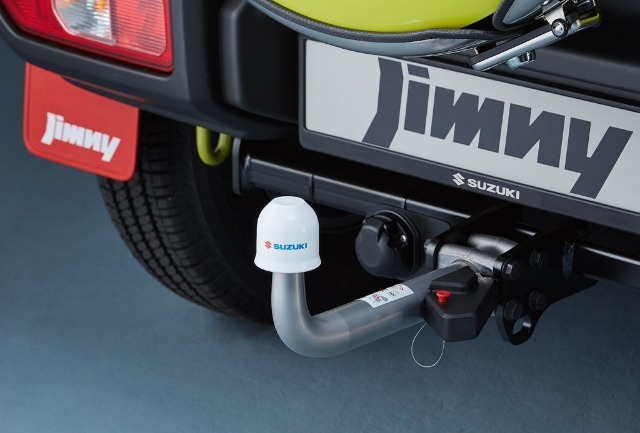 Does anyone know if the detachable towbar could be used as a rear recovery point, obviously using the bracket and not to tow hitch? Soeley wrote: Does anyone know if the detachable towbar could be used as a rear recovery point, obviously using the bracket and not to tow hitch?